Henley-in-Arden is a charming and friendly small town in the heart of the old Arden region. Henley has a long winding High Street, about a mile long, with well-preserved old buildings on either side. 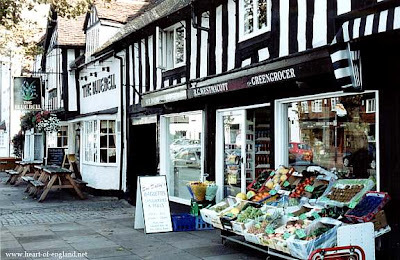 These are small human-scale buildings, unlike the grandiose High Street in Chipping Campden, and the shops are not as commercialised here as in, for example, Broadway. A castle was originally built here, sometime before 1140, probably with help from the Earls of Warwick. 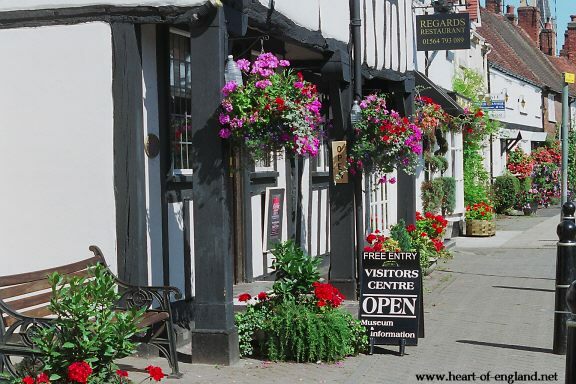 The oldest building in Henley, shown here, houses the Henley-in-Arden Heritage Centre. This is a model of Henley Castle inside the Heritage Centre. At that time castles were built of wood. Stone castles date from around the 14th Century. The wooden castle has long since disappeared. The archaeology program Time Team visited the town, and made some excavations on the site of the old castle. The Time Team TV program may be watched here: Watch Time Team. 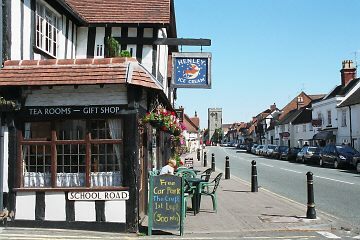 Next door to the Heritage Centre is the popular Henley Ice Cream Parlour. 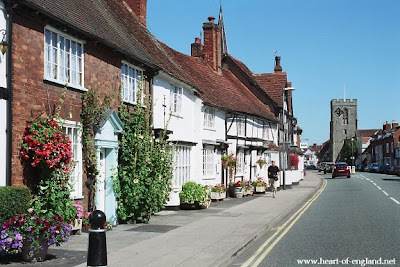 Henley lies on the road between London, Stratford and Birmingham, and a trading town grew up along the road, forming the High Street. 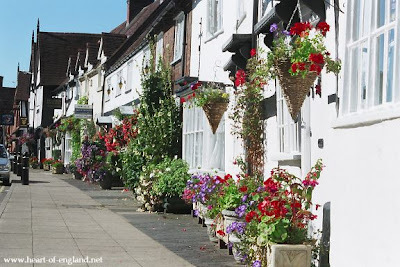 Many of the people living along the High Street take a pride in the floral displays outside their homes. 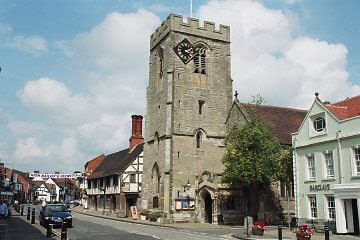 At the mid-point along the High Street is the church of St John The Baptist, and just beyond the church is the Guild Hall. 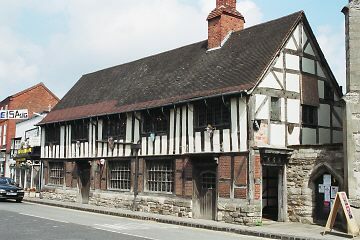 The well preserved Guild Hall near the mid-point of the High Street is evidence of the tradesmen who made this town important. The wide pavements are used for outdoor tables by several pubs and cafes. These give the main street a relaxed atmosphere. Several inns along the modern High Street were old coaching inns. 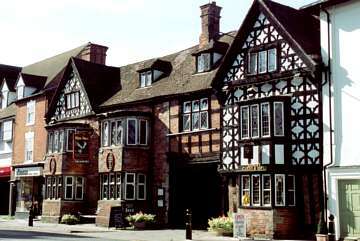 This is the White Swan, a 16th century coaching inn. Henley was for a long period the major market town in the Arden region. Until a few years ago there was a thriving livestock market here. 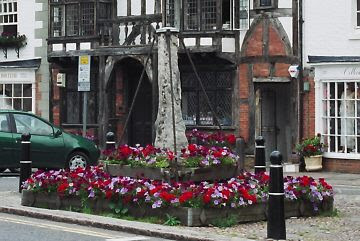 This is all that remains of the town's Market Cross. 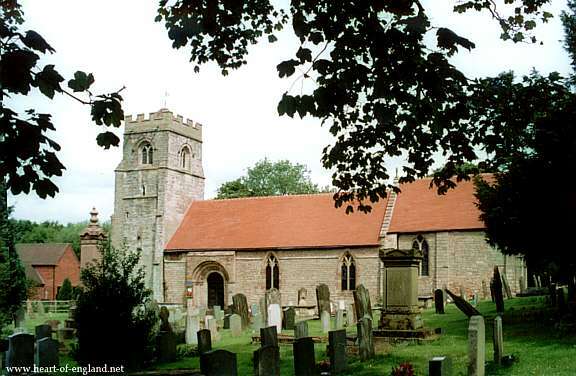 Just behind the town is the Norman Church of St Nicholas, built at the same time as the castle.